Map showing location of Arkansas on the US map. 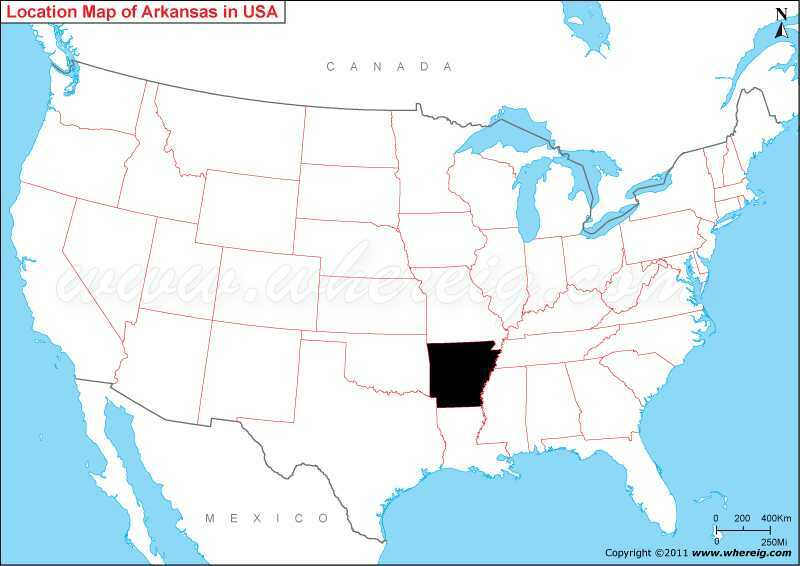 Arkansas state map gives clear view that Arkansas is located in the south of the United States of America. Six states of the US share their boundaries with the Arkansas i.e. Mississippi in the east, Tennessee in the north-east, Missouri in the north, Colorado in the west, Texas in the south west, and Louisiana in the south. The state has very diversified geographic features ranging from mountain ranges to highlands, lowlands and long river valley of Mississippi River. The given map of Arkansas shows, its capital city i.e. Little Rock is situated in the central part of the state. Besides, the Arkansas map also shows the major cities of Arkansas along with major highways, other roads, and railways. The name of this state is quite interesting; it is Algonquin name of the Quapaw Indians, related to "Kaw" tribe and word "akakaze" meaning "land of downriver people" or the Sioux word "Akakaze" meaning "people of the south wind". Among the tropical humid climate, the state has quite developed infrastructure including roadways, railways, and airways.